Welcome back to our slightly delayed ATXIV breakdown. This time we’ll be looking at Rote Kapelle, SAMURAI SOUL’d OUT, Scary Wormhole People, Shadow Cartel, Snuffed Out, SOLAR FLEET, Spaceship Samurai and Spectre Fleet Alliance. Rote Kapelle are an old school team that’s longing for the days when Syndicate was the hub of PvP, fights were honourable, balance was good and before the game was ruined by risk averse blobbing pubbies. Or at least that’s the rose-tinted view ex-team captain Bacchanalian gave me when we were casting ATXII together. Seriously though, despite not making the headlines as of late Rote Kapelle are an old alliance with a lot of old talent and despite not being at their peak they still manage to put solid runs in year on year. ATX: Beat Percussive Pizza Time Diplomacy, Fluffeh Bunneh Murder Squad, Kill it with Fire, Pandemic Legion and then lost to Verge of Collapse and Red versus Blue. ATXI: Beat Wormhole Holders, The Fourth District, Verge of Collapse, lost to THE R0NIN and Agony Empire. ATXII: Beat The Fearless Empire, SCUM. and Ministry of Inappropriate Footwork, lost to Pandemic Legion and THE R0NIN. ATXIII: Beat Affirmative., lost to Dead Terrorists, beat Scary Wormhole People, eliminated by Out of Sight. Last year was arguably Rote’s poorest showing despite winning two games which for most teams would be considered a good achievement. I really hope we see a resurgent Rote this year rather than watch them fade away into the annals of tournament history. By the looks of zkill, SSO spent their days PvPing around southern FW space and Providence. It’s another fresh face to the tournament that has unfortunately pulled a seriously strong team in their first round. In some ways this can take off the pressure since if you lose it was to be expected and it’s no shame but if you win it’s an incredible upset and you immediately make the headlines. SWP made their first entry to the tournament last year where they were unlucky enough to face Gorgon in the first round. They managed to not lose hope however and came back to beat Chaos Collective in the loser’s bracket but then hit another big name team in Rote Kapelle which ended their tournament run. I had hoped to see more from them this year, as they had a super unlucky bracket in ATXIII, but sadly that seems not to be the case as they’re up against TEST in the first round. First Match: A Band Apart. Post-Phoebe Shadow Cartel and Snuff fully took over the role of being the boogeyman of LowSec role from Pandemic Legion; a position they’d shared for some time. Shadow Cartel are a scary and inventive AT team, being one of the first to really show the viability of logistics frigates in the tournament setting. Their first time out in ATXII they were somewhat one-dimensional in their setups bringing either a crazy amount of DPS or a crazy amount of rep power. However, in ATXIII they diversified and showed that they could field a varied and well-practiced roster of comps and both times they made solid runs into the bracket. In my mind Shadow Cartel are kingslayers, one of the teams that the top teams really don’t want to face as they can without warning pull something out of the bag and demolish them. SC came extraordinarily close to beating even Pandemic Legion on ATXII. This is a tournament classic that I would absolutely recommend anyone to go watch for the emotional rollercoaster that was that match. There is, however, one drawback. Apparently this year the Shadow Cartel team lost some of their AT core which could spell disaster, as it has for many a team in the past. Previously URINE Alliance, another low-sec powerhouse, Snuffed Out are yet to achieve the same level of tournament success as their lowsec nemesis, Shadow Cartel. Both groups tend to be hesitant to leave LowSec because bubbles are scary but make an exception for the Alliance Tournament. As far as I can tell this is their second run at the tournament. All the way back in ATXI they lost to The G0dfathers, beat Kill It With Fire and then were eliminated by Shadow Cartel. Solar are an old school Russian group, possible one of the most well known Russian kings in the east to us filthy westerners. At the time of writing, SOLAR hold 132 systems of sovereignty making them one of the AT participants who simultaneously hold the most space. The vast majority of it is in Outer Passage, where they hold all but two systems, but they also have space in Cache, Detroid, Insmother, The Spire and Wicked Creek. This is Solar’s seventh run at the alliance tournament though they are yet to make a significant impact on the tournament scene despite their many previous attempts. ATX: Lost to Dead Terrorists and Brick Squad. ATXI: Lost to HYDRA RELOADED, beat Darkspawn., lost to M.I.F. Previously a member of the HERO coalition with their first round opponents, Brave Collective, Spaceship Samurai are now friends with another new player group, Pandemic Horde, holding a couple of systems of sov in Fade. To my knowledge this is Spaceship Samurai’s first attempt at competing in EVE tournament play so the best of luck to them! 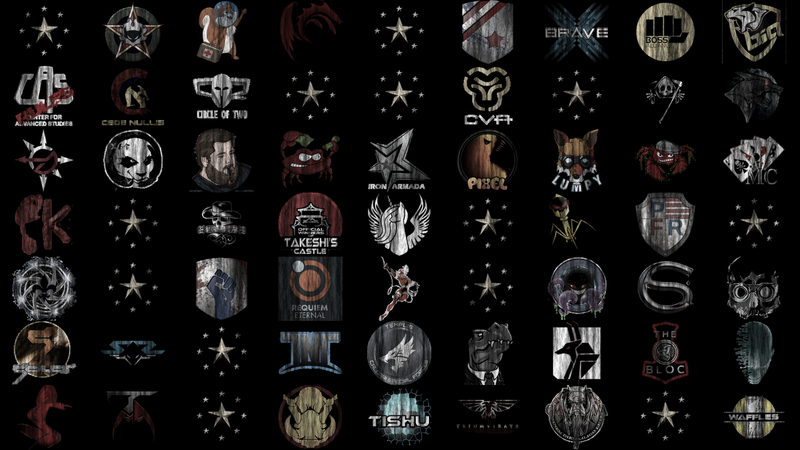 Spectre Fleet Alliance, formed only at the end of last year, are the Alliance associated with Spectre fleet, a NPSI community who took up a lot of the space the RvB Ganked roams did/do. Spectre Fleet also had a respectable run at the sov competition, when CCP wanted to test the new sov mechanics, in which Entosis modules were given their flavour text as prizes. They are too young to have participated in any previous tournaments.